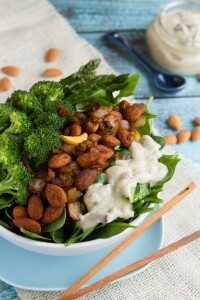 Greens bowl loaded with steamed greens, paprika roasted almonds and a creamy mushroom sauce. Preheat oven to 350F and line a baking sheet with parchment paper or a silicon baking mat. Add broccoli and asparagus to the sheet. Roast for 15 minutes. Meanwhile, add oil and cumin seeds to a medium-sized frying pan. Toast on medium-high heat for 2 minutes, until fragrant. Add onions and garlic. Reduce heat to medium-low and saute for 10 minutes, adding a splash of water a couple of times if needed. Add almonds, paprika and salt. Continue to saute for 10 minutes. Place 2 cups of spinach in the bottom of each bowl. 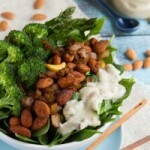 Pour mushroom soup over top then stack veggies and paprika almonds on top. Serve! To make nut-free: replace almonds with pumpkin seeds or sunflower seeds. Replace almond milk in the soup with whatever non-dairy milk works for you.